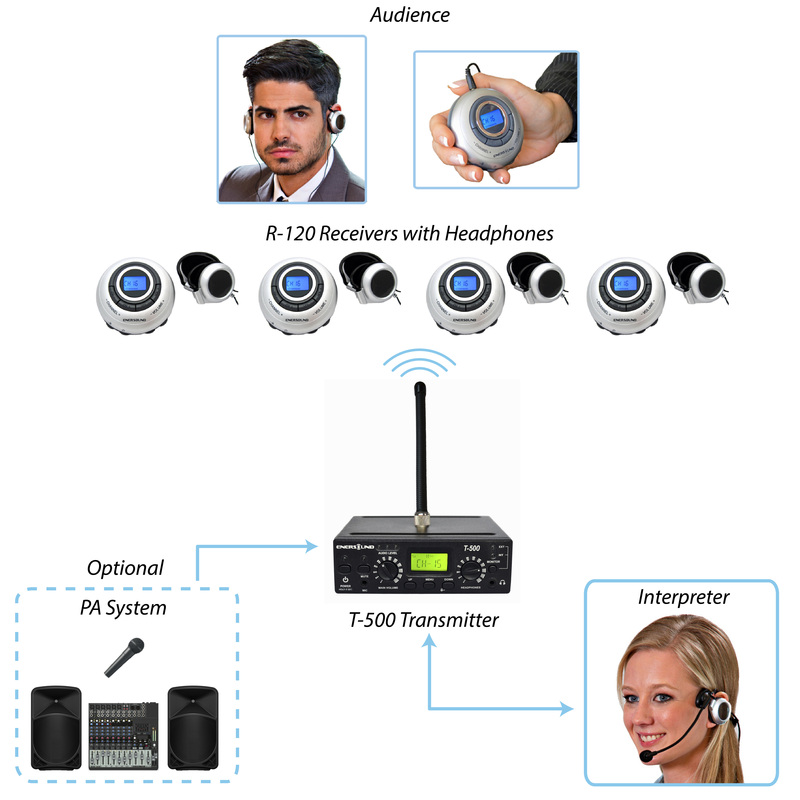 This 25-person Professional-grade Wireless Simultaneous Translation System provides superior sound quality and excellent coverage range, combining multiple-channel transmitter and receivers, as well as improved reliability and versatility. It can be expanded by adding an unlimited number of additional receivers. More foreign languages can be added for a maximum of 6 in the same room by purchasing 1 additional transmitter and microphone per language. -CAS-25 Carrying Case: 1 year factory warranty. The solution we were waiting for! Being a Miami based house of workship, almost half of our community is Spanish speaking; however our priest is not. As time went by, it became a problem to translate the service to everyone. Until we found the Enersound translation system!!! Now we can´t think of a better solution, we feel blessed and our community keeps getting bigger and bigger! I would recommend it to any pastor, priest or minister who is struggling with reoccurring integration issues. I developed an action plan to begin to deal with it and decided to make an investment. It has given me a fresh start and hope in my ministry. I love the transmitter and the receivers too.I think it is impossible to really describe how much having this system is still impacting my church.Without question I’m really connecting with people here in a way I never did before.Keep up the great work! I knew I needed something different. It turned out to be that something different. Only God knew that this was exactly the thing I needed. I learned many things about interpretation and technology that definitely impact my effectiveness in leading. I received in the small groups and I finally began the process that changed my church, I have a renewed congregation now and I feel the excitement about the future of my ministry. Thank you very much for it turned out to be that something different.It has even been more powerful for me because I’ve seen and experienced first hand what it is to be understood by everybody since we have a congregation that comes from everywhere around the world.Thank you once again for being a conduit for the Spirit of God. Every church should have one of this and see the difference it makes with traditional interpretation.When I first heard of it, I was perhaps the most outwardly skeptical person in the place.I sat as far away from the front of the room as possible. It didn’t take more than a day for my heart to get fully engaged.It was without doubt the most profound experience I’ve had after meeting the Lord.The group sessions seem to be better now.I would say the real growth began after buying it.I am amazed at what the Lord is doing in my life as a result of this.I look forward to coming out and spread the word. With the interpreter monitor feature the experience was incredible.Keep up the good work! We use it for our College Auditorium, and since we bought it, we never had any kind of trouble with it. People who need it for translation are very satisfied, and the same happens with those with hearing problems. Highly recommended! Click the button below to add the 25-Person Translation System with Interpreter Monitor to your wish list.